Now that we’re in full-on summer mode, it’s time to stock a few warm-weather necessities to keep your skin and senses calm all season long. 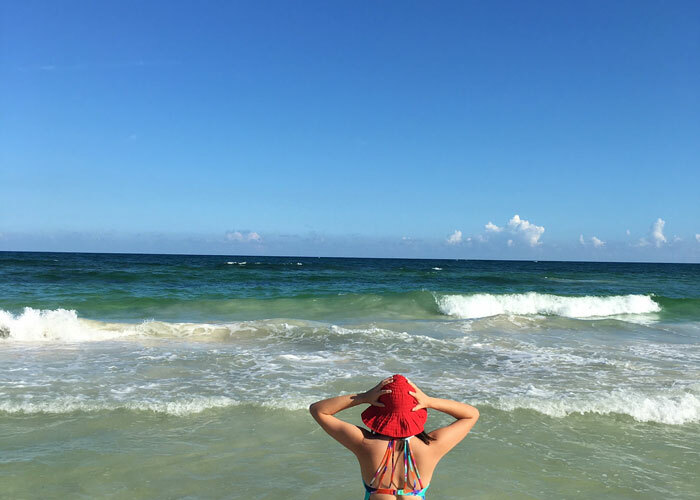 Besides the obligatory sunscreen, I like to keep a few key items in my outdoor fun bag to ensure my skin is ready for whatever a weekend outside may throw at me. It’s not easy to get me up early on the weekends (or, let’s be real, it’s a struggle during the week, too). But, one thing that will have me up and at it on a Saturday morning is a planned hike out at the nearby nature sanctuary. 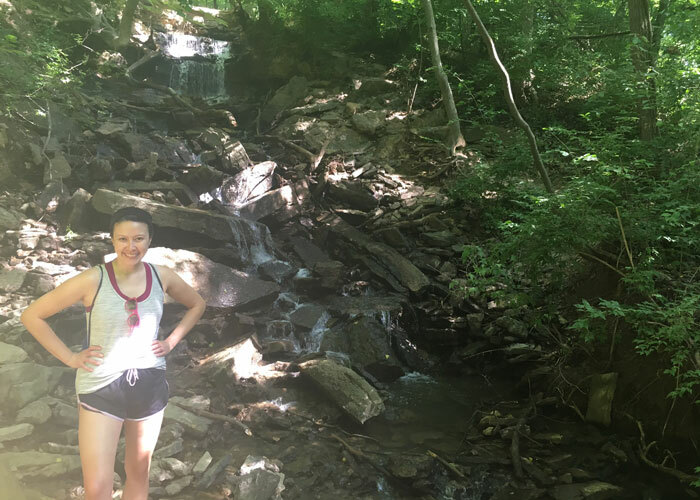 The beau and I love trekking through the woods and finding beautiful waterfalls, funky trails and other jewels along the way. But one thing we don’t want to encounter? Bugs. Specifically, mosquitoes. To keep these bloodsuckers at bay, I spray a light layer of NOW Solutions Bug Ban all over my body. It’s made with a concoction that I love but mosquitoes hate, namely citronella, lemongrass, rosemary and thyme. This natural solution protects my skin from bugs without the use of harsh chemicals. Though I’ve cut back on my “laying out by the pool” ritual a lot over the past several years, I’ll use my vitamin D-deficient status as an excuse for at least a couple great (sunscreened-up!) pool or beach days each summer. As long as I’m diligent about applying and re-applying sunscreen, I have no problem catching a few rays here and there. And it makes it even more enjoyable, post-pool session, to wash up and then apply a light layer of aloe only to cool the skin and feel refreshed. But, if for some reason I get a little redder than expected, aloe is still the go-to solution to calm and soothe overbaked skin. NOW Solutions Aloe Soothing Gel is the multipurpose solution for your skin, designed to refresh and revitalize sun-exposed skin with aloe and cucumber extract. A bit of vitamin E and peppermint add a cooling touch. Pro tip: Keep this baby in the fridge to maximize the cooling effect. No matter what the season, anytime we go from one to the other, my sinuses take a toll. While there’s nothing to really do besides power through, I have found that having essential oils on hand to sniff gives me some moments of peace and clarity. The perfect starter set? NOW Solutions Seasonal Changes Balancing Essential Oils Kit. On some days, all I need is a quick whiff of a potent, cleansing essential oil, like tea tree or eucalyptus, to clear my head and senses. On other days, when the pollen count is high or some other allergen is taking over the atmosphere, I like to dilute a drop or two of Clear the Air into a healthy dollop of jojoba oil and apply a light layer around my nostrils. This allows me to breathe in the fresh scent of peppermint, eucalyptus, hyssop and rosemary throughout the day. If I wake up feeling a little congested or stuffy, my go-to trick for starting the day off right is to shake out several drops of essential oils into my shower before cranking it up and allowing the steam to envelope my body and senses. 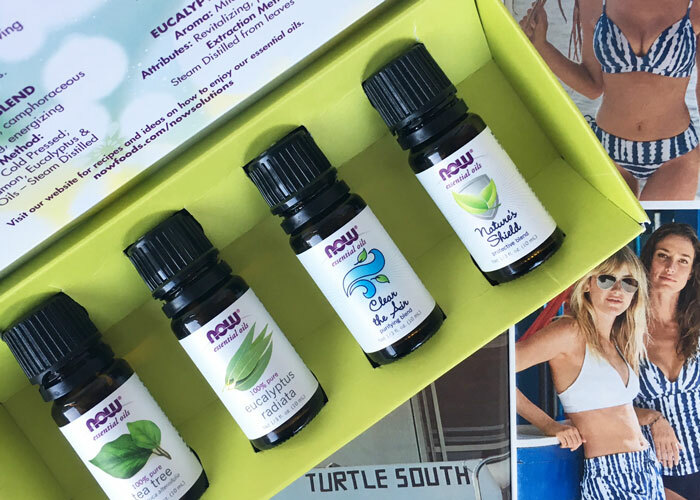 Any combination of essential oils in the NOW Solutions Balancing Essential Oils Kit is perfect for this at-home steam spa! If you’re like me, you may get addicted and start building a beautiful essential oil collection to tinker with custom morning blends. Grapefruit, lemon and lime are some of the most cheerful EOs to add to your collection! What are your go-to summer skincare solutions? Do you have any favorite sunscreens, after-sun treatments, bug sprays or essential oils to share? Where are you going this summer? Tell me in the comments!